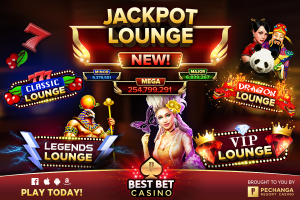 Win Big Casino Jackpots With Jackpot Lounges! Win big casino jackpots with a new twist on your favorite slots with the new Jackpot Lounges! Connect your account to Facebook or pick from over 70 emojis to represent your seat in the lounges. Play with up to 4 other friends in 4 unique lounges for hundreds of hours of interactive slot spinning fun! Cheer each other on with quirky in-game chat notifications to talk to & congratulate players when they win BIG! Dragon Lounge – this lounge features some of the HOTTEST games of today like China Shores™ and Fortune Stacks™! Can you handle the heat & WIN? Legends Lounge- Play your way up the leaderboards where you & your friends team up & spin to become the next legendary players of Best Bet! Classic Lounge- Looking for the classics? Skip the fluff & spin in Pechanga’s very own, Pechanga X’s Slots, Double Luck Nudge & more! VIP Lounge- For the ultimate challenge, try your luck in the VIP Lounge, only open to our most exclusive & loyal players. Increase your Pechanga VIP Status to unlock new rooms with MASSIVE casino jackpots! The best thing about Jackpot Lounges is that you all share Minor, Major & Mega progressive jackpots, if one wins, you all WIN! How do you win with Jackpot Lounges? Minor, Major & Mega Jackpots are only available when playing the slot machines in the Jackpot Lounge. At the end of any spin the player has the chance to enter the Pick’em Bonus game. The rewards in the Pick’em Bonus game depends upon the total bet of the spin which triggered the bonus game. Eligibility for the Minor Jackpot at any level. The player is eligible for the Major Jackpot on bets greater than 10k. You can hit the Mega Jackpot on bets greater than 200k. There may be up to 5 players playing together on one machine. When a player triggers a Pick’em Bonus game, all players in the particular game can watch and participate in the community bonus. The community bonus is dependent on the players total bet. You must be actively playing (not idle) to remain in the Jackpot Lounge. Staying idle during the Pick’em Bonus game will result in the game auto-picking for the player. 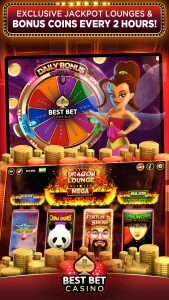 Best Bet Casino is available on your favorite mobile & computer device. Download for free here to get huge casino jackpots!